There are two commercially important species of clams harvested in Florida, the northern quahog (Mercenaria mercenaria) and the southern quahog (Mercenaria campechiensis). Hard clams are caught wild in the Florida's central and east coast waters. They are also harvested from leases in five east and west coast counties where they are farm-raised. Clams are perhaps the most versatile seafood in the world. 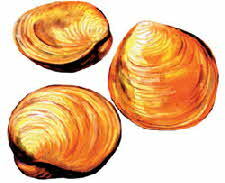 The hard clam is a brown nearly oval-shaped bivalve mollusk with thick, hard shells that protect the meat. It can grow to width of 4 1/2 inches and is marked by rings or ridges that indicate its growth and age which can be more than 30 years. The most prominent features of the hard clam's body are the foot and the neck, or siphon. The foot allows the clam to bury itself in soft sand. The tube-like neck pumps sea water, up to three gallons an hour, in and out of the clam. During this process, the hard clam filters out and feeds on plankton and other microscopic organisms. Hard clams are harvested year round. Hard clams, mostly of the Mercenaria mercenari variety, are farmed-raised in Florida by farmers who lease coastal water bottoms and plant seed clams under nets or in mesh bags. Farmers monitor the clams until they reach market size in 1 to 1 1/2 years. 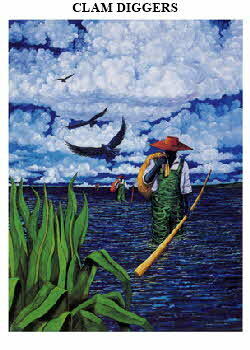 Wild hard clam fishermen and some farmers use a "jerk rake" to harvest clams. A rake-like head on the end of an elongated steel pole is manually dragged or jerked across the bottom to pull the clams up and out of the sediments. The clams are then graded and marketed by the depth of the shell at the hinge side or they are shucked and the meats canned. Firm texture, rich meat with sweet to slightly salty flavor. Extra lean. • In-shell Clams: 6 whole clams per serving. • Shucked Clams: 1/2 pint per serving. • Live clams should close tightly when tapped. • Discard any clams that don't close; this is an indication that the shellfish are dead. • They should have a mild odor, similar to the ocean. • Live clams should be free of cracks. • Middle neck, little neck and pasta are names related to the size of the clam. • They will remain alive for up to seven days in the refrigerator when stored at a constant 41 degrees F in a container with the lid slightly open. • Drain excess liquid daily. • Clams should never be placed directly on ice. • Clams should never be immersed in water for storage purposes. • Clams should never be exposed to sudden temperature change. • Clams have a fresh odor when freshly shucked. • Refrigerate shellfish in a sealed container on ice or in the coldest part of the refrigerator. • Store shucked clams up to seven days. • Wash live clams thoroughly under cold running water prior to cooking. • To grill: Place about 4 inches from hot coals. Grill for approximately 10 minutes or until clams open. • To roast in oven: Place on a baking sheet on the middle rack. Roast at 350 degrees F for approximately 10 minutes or until clams open. • Serve roasted and grilled clams in shells with melted butter or a sauce. • Clams become plump and opaque when thoroughly cooked.